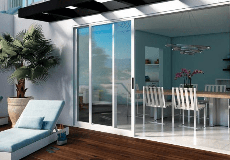 As your local Milgard Certified Dealer, Legendary Doors & Windows has quickly become the first choice when it comes to Orange County replacement doors and windows. We offer an exceptional line of high quality, durable, energy efficient and long lasting windows and doors made from various materials to suit the needs of any home owner. Everything is custom made and built to fit from reliable, warrantied and trusted companies such as Milgard. With over 30 years of combined experience, Legendary is proud to be a family run business with an exceptional team of employees. Jason and Pearl Hopkins started Legendary Doors & Windows in Orange County, CA in 2010 with nothing but a dream and hardwork. Nearly 6 years and a couple thousand satisfied customers later, Legendary Doors & Windows is now one of the highest rated window and door installers in all of Southern California. Legendary Doors & Windows is rated 5.0 out of 5 by 5. Rated 5 out of 5 by jheinly from Very happy with our windows We definitely recommend Legendary Doors & Windows. We will be calling them next year when we are ready to put our windows in the downstairs of our house. Rated 5 out of 5 by Bjmccredie from this dealer was all around A+ I couldn't be happier with my experience with Legendary Doors & Windows. There helpfullness and knowledge was top notch. I will definatley be using them in the future. Couldn't be happier! Rated 5 out of 5 by Kim247 from Legendary Windows were great from start to finish! We had all the windows in our home replaced by Legendary Windows. Jason, Scott, Wes and Ben were fantastic to work with. They were knowledgeable, professional and very friendly. I have recommended them to all my family and friends! Rated 5 out of 5 by matt1111 from Great Window Company to work with! I recently had Legendary install windows throughout my house. They showed up when they said they were going to. The installers did a great job and were very professional. The first job went so well that I had them come out twice more, once to do all of the doors in the house and then a second time to do the windows and doors in an addition. Thanks!